The Hague University of Applied Sciences is a 30 year old institution and a UNESCO University of Applied Sciences. The themes of peace and human rights, intercultural learning, world citizenship and sustainability are at the forefront of what we do. We have four campuses: The Hague, Delft, Zoetermeer and the brand-new Zuiderpark Sports Campus. 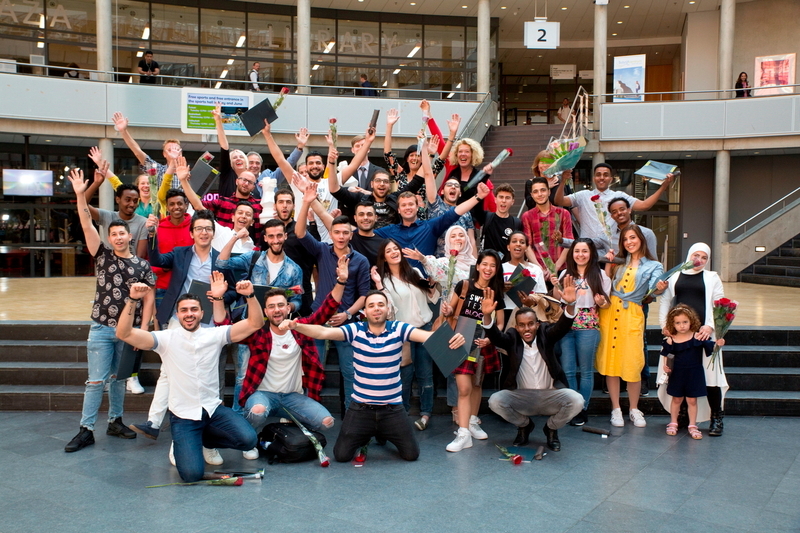 THUAS today is an innovative environment where students, teaching staff and industry experts from around 146 different countries come together to share in educational development, networking and best practices. As a university of applied sciences THUAS offers programmes that focus on the practical application of arts and sciences. Getting practical work experience through internships is an important part of the professional study programmes offered at our institution. All of the university’s programmes revolve around group and project work and simulate real-life situations. Every curriculum includes a semester of internship in a field related to a student’s choice of study, enabling them to experience how the knowledge gained inside the classroom is relevant and applied in the professional field. Although a small country in size, The Netherlands has a big international presence. It is the 21st largest economy in the world. Some of the world’s biggest multinationals, including Philips, Heineken, KLM, Shell, ING Bank and Unilever, are Dutch. Nowhere is the link between education, business and government so close. The city attracts over 40,000 students from all over the world making it a truly international student city. 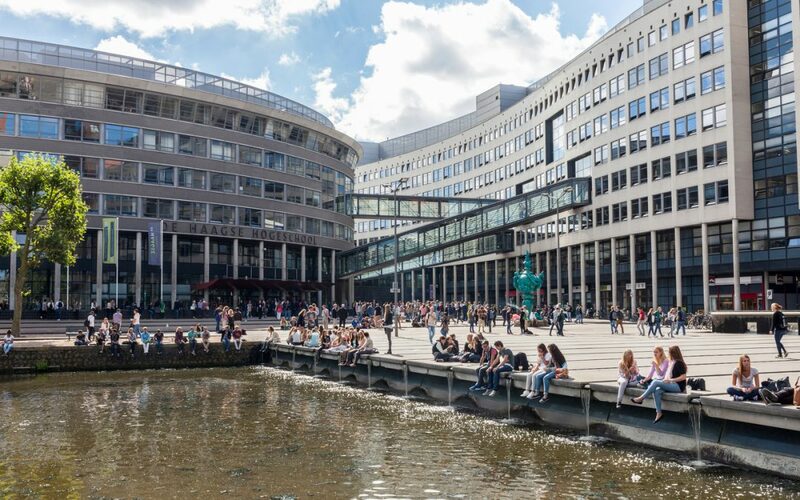 The Hague’s international attitude and location in the heart of Europe attracts big-name multinational companies and organisations, including Shell, Siemens and T-Mobile. THUAS taps into the resources of the 300 international businesses in the city, which collaborate with our programmes. Unilever, DSM, Shell and the International Criminal Court are just some examples of the companies and organisations offering work placements and providing guest lectures to THUAS students. The Hague is home to all government ministries, embassies and the Dutch supreme court. More than 160 intergovernmental and non-governmental international organisations are also housed in this truly international city. Are you up for a challenge that comes with career options? Our fast-track version of European Studies mixes business, politics, languages and skills with an exchange and an international internship. This prepares you for management or marketing jobs in public and private sector organisations, or for an international master’s degree. Industrial design engineering is a rapidly changing field of expertise – customers are becoming ‘prosumers’, products are developed in an ‘open source’ and international context with new production technologies. Co-creation and open innovation mean that new concepts are having a positive impact on society, businesses and the environment. Can you create an innovative new product based on customer input? You can when you complete the Industrial Design Engineering (IDE) bachelor course. The Hague is the global hub of International law. No wonder that the International & European Law programme is able to train some of Europe’s most aspiring legal experts, who currently work at International Tribunals, major law firms and human rights organisations. How do you export Dutch produce to international markets? Or make business processes more profitable and efficient? Companies around the world need commercially minded professionals like yourself to steer its business in the right direction. International Business gives you the fundamentals of doing business. Kick-start your career as an entrepreneur, financial consultant, or business analyst. Or would you be better off as a corporate communications manager? An international communication manager works in a global environment with colleagues, customers and competitors from multiple cultures and languages. Communication professionals design and shape the messages of organisations. Not just during crisis situations where the world is watching and every second counts, but also in achieving commercial aims through advertising or public relations. Financial managers do more than just ‘crunch numbers’. They understand cash flow and mastermind the right financial game plan in any situation. If you have a head for figures, the three-year IFMC programme is the next step for a career as a financial officer. We call this ‘business + impact’. Help solve the European immigrant crisis, or devise an evacuation plan after flash flooding in Greece. International governmental issues are at the very core of International Public Management. Experience how there’s more to public management than bureaucracy. Process & Food Technology (PFT) engineers embrace transparent, ingenious and sustainable methods to produce consumer goods. This could be developing new products or improving existing production processes at small local companies and large multinationals like Proctor & Gamble, Unilever or Danone. The work of chemical engineers is all around us in our daily lives, from the foods we eat to the materials used in the packaging to preserve them. CT engineers design, produce, test and evaluate chemical or food products. How do you guarantee the safety and security of citizens during global terrorism threats? Or design safety and security protocols for industrial giants? The four-year, full-time Safety and Security Management Studies (SSMS) degree will expose you to the three key foundations of safety and security – international security, public safety and industrial safety. So, if you see yourself as strong-willed, focused and ambitious, want to be in the hub of a vibrant, international community and have your sights set on an exciting safety or security career, SSMS is for you. ISPM develops the international sport managers of the future. This programme “Fast-Tracks” your exciting career in international sport management. In just 3 years you can be the essential ‘interface’ between sport and business.